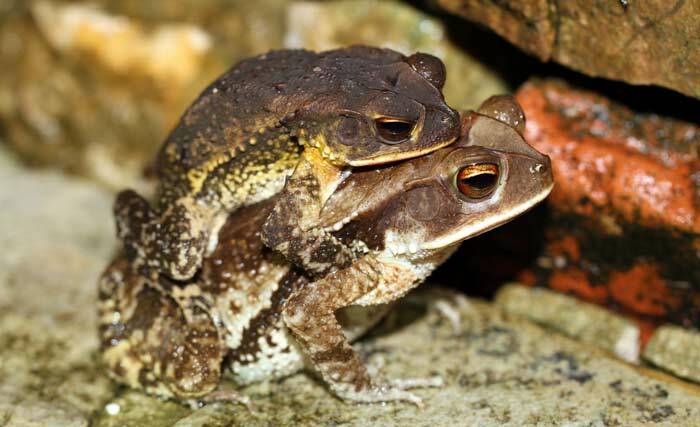 Toads reproduce via sexual reproduction with the female eggs fertilized by the male toad; a source of water is required for reproduction to take place. Males attract females with a mating call. The mating call is also used to keep other male toads from encroaching on a male’s territory. Fertilized eggs hatch into tadpoles that use their tails to swim and that have gills that allow them to breathe beneath the water. As the tadpole metamorphoses into a toad, its tail and gills eventually disappear and legs grow. After its legs grow, it can begin to live a life on land and in water, using its legs for swimming.